Muay thai is a combat sport from Thailand known as “the art of eight limbs.” It gets its name from the fact that it uses the fists, elbows, knees, and shins to dominate full-contact combat. It wasn’t widespread until the 20th century, when muay thai practitioners defeated well-known experts in other martial arts. 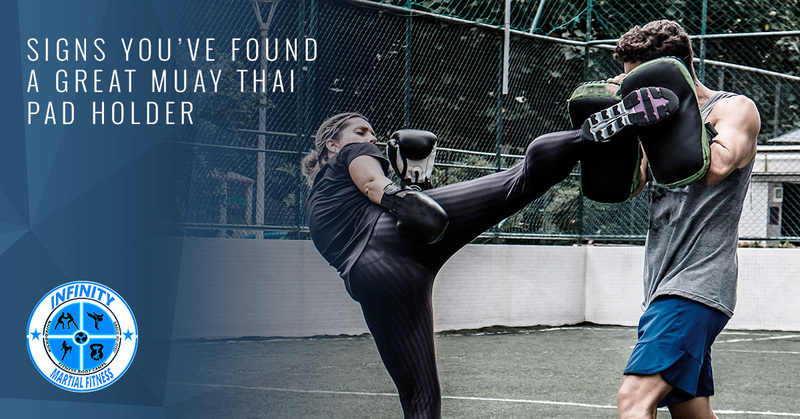 Today, you can find muay thai clubs in pretty much any town, and hundreds of thousands of people are benefiting from its vigorous conditioning and empowering combat style. A skilled pad holder will be able to see how skilled you are and adapt to your abilities. If you’re a beginner, the holder will focus on the basics and making you stronger. However, if you’re more advanced, the holder will go more advanced or help you drill the fundamentals. It is key to remember that nobody gets good enough to leave the fundamentals behind. By the same token, drilling a beginner in an advanced move is a bad idea. An advanced move cannot benefit a beginner, who will probably become confused and would be better off spending energy learning the basics. A great muay thai pad holder empowers whoever they’re helping to practice the strikes a person uses when fighting. Instead of drilling flashy combinations, they will bolster the basics, building rhythm, strength, and confidence. In this way, the pad holder can pass on their own fighting knowledge. The pad holder is more than just that, after all; they are a teacher. Muay thai has a rhythm to it, which is something that inferior trainers will fail to ingrain into their students. The students end up trying to show off and getting very tense. Interestingly, relaxing and slowing down allows you to catch that back and forth motion and become a better fighter. Clenched muscles tire faster, and it is important to be extremely efficient with all of your motions, tensing up to strike when the time comes, and then relaxing again to conserve energy. A great pad holder will help you develop this rhythm. Muay thai fights are five rounds long, which is a significant amount of time. Even if you’re not training to fight, endurance and stamina are still key to your training success. A good pad holder will work on pushing your stamina and endurance higher and higher, especially if you are training for a fight. If you aren’t training for a fight, your pad holder may focus more on your technique. This is a rare skill to find in pad holders. Being able to freestyle requires a holder to have very quick reflexes. They won’t call out combinations, but allow you to strike when and where you want to. It can be very valuable for teaching fighters to think about their next moves and generally isn’t the best for beginning practitioners, who will get confused. We train both jiu-jitsu and muay thai at our welcoming facility in Hanover. Our training team is experienced and dedicated to providing the very best training to anyone who walks through our doors. There is nothing better than the constructive outlet that muay thai provides people who want to take their lives to the next level. Contact us to learn more about what we can do for you today!